Expensive upgrades may not pay off if they’re not the norm of the neighbourhood. 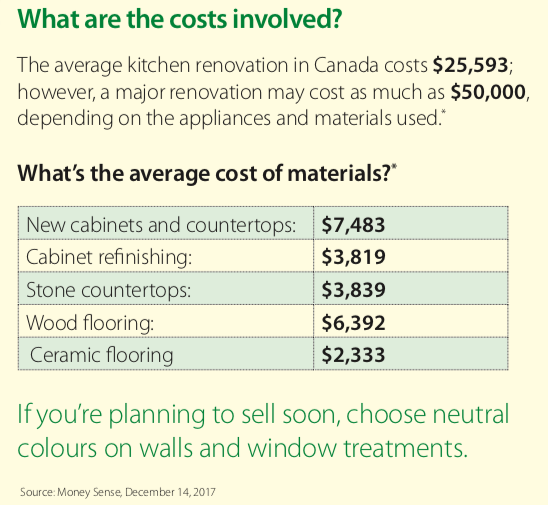 If you plan to sell soon, choose materials and appliances that are on par with the style of the average home in your area. 2. Don’t over-improve the room; you’re unlikely to get a return on your investment. Instead, make simple upgrades to your lighting, fixtures, and hardware and freshen the space with a coat of paint. 3. Update appliances, especially if they’re no longer working efficiently. Resist the urge to upgrade to high-end appliances, unless it’s in keeping with the style of the home.